Depending on where you live, you may or may not have encountered a poisonous plant or two in the wild. If you’re an avid camper like me, you definite have. Trekking along the Appalachian Trail through southern Tennessee, I’ve had my fair share of rashes and bumps from a lack of care and long pants. A little known fact is that all three species of plants mentioned in this article cause the same allergic reaction. Here we’ll learn which plants are poisonous and how to identify them around your campsite. While this one may not be a surprise to you (especially since there’s a Batman villain named after it) you may not be aware of how this easy-to-miss vine literally gets under your skin. Characterized by having asymmetrical buds and by having three leaves per bud, it has been immortalized in the popular phrase: “Leaves of three, let it be”. Aside from these characteristics, there are two species of poison ivy. Eastern Poison ivy can be found in the north and southeastern areas of the United States as a climbing vine, a short shrub, or a small sprig dotting the forest floor. The leaves are often slightly serrated, but never saw-toothed and the plant is devoid of thorns. This subspecies is abundant all over the eastern coast and can be found almost anywhere. Western Poison Ivy usually makes its home in the northwestern territories with an established presence in the northeast as well. This subspecies always grows as a shrub and often has clusters of berries which should never be eaten under any circumstances. It is harder to find than its eastern cousin, but it’s just as harmful. Atlantic Poison Oak primarily grows in the southeastern coast with the exception of southern Florida. 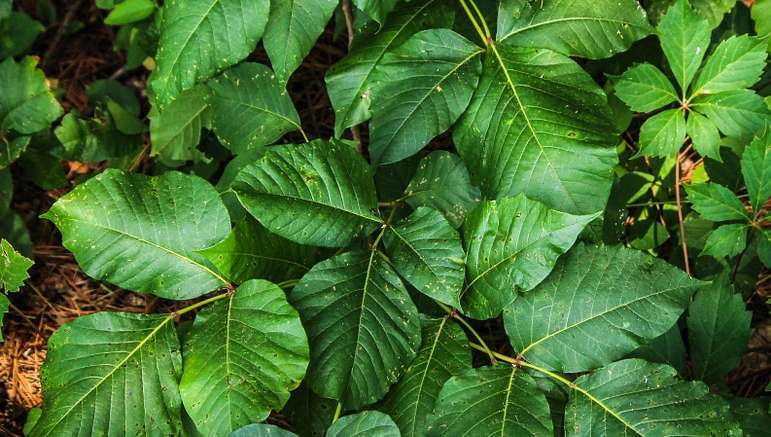 It has the tendency to look strikingly similar to eastern poison ivy, and since it causes the same skin irritation it’s more important to note the three serrated leaves and avoid the plant altogether. This subspecies also has berries coated with fuzz, which is an identifiable characteristic. Pacific Poison Oak grows almost exclusively in California and western Oregon. Since it usually grows into a tall, thick shrub and can spread over miles, it can cause serious problems to the people living nearby should a brush fire happen. If you stumble into one of these, the resulting rash may require a hospital visit. Decidedly different than the above two species, poison sumac does not adhere to the three-leaf rule. Rather than being a vine or a shrub, it grows as a tree with leaves sprouting all along bright red stems. Usually found in wetlands along the east coast, poison sumac can be distinguished from other sumacs by their low-hanging berries and flowers. There you have it. Pay attention to the leaf patterns and shapes to identify the poisonous plants that may be lurking near you. If you contract a rash after coming in contact with one of these plants, it is advisable to see a doctor if possible to see if your allergic reaction will become a severe one. Be the first to comment on "Three Poisonous Plants to Avoid When Camping in North America"